The cosmetic and aesthetic industry is constantly evolving in response to new scientific discoveries and technological innovations that allow practitioners to better address common “skinsecurities.” One of the most exciting parts of my job is learning about these industry developments and finding new, cutting-edge treatments to introduce to our patients. We always want to offer the best quality care possible, which is why we make sure to stay on top of any and all industry trends! An aesthetic treatment that has made headlines in recent years is the Vampire Facial. 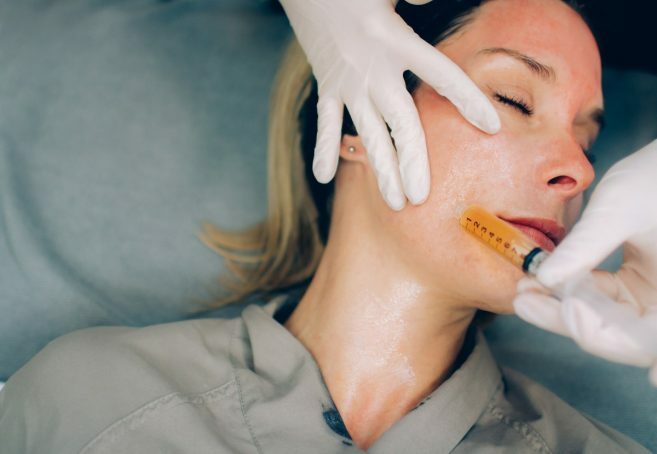 Whether you heard about it during a recent appointment or from the hit reality show Keeping Up with the Kardashians, the Vampire Facial has drastically grown in popularity across the U.S. While the treatment name certainly has become well known, public knowledge on what it does and how it works remains relatively low. I have witnessed firsthand how transformative this treatment can be and want to share exactly what you can expect during a Vampire Facial. The Vampire Facial stimulates your body’s natural processes to improve issues such as uneven skin texture, acne/acne scars, pore size, fine lines and overall skin health. This treatment harnesses the power of platelet rich plasma, more commonly known as PRP, to stimulate collagen development and soft tissue remodeling in the body. People commonly think PRP is extracted from an external source, or that it is simply applying regularly drawn blood to the face, but this couldn’t be further from the truth. PRP is obtained directly from your own blood using an FDA-approved extraction process (you can find more detail in step two below). We see patients of all ages and skin types for this treatment and have helped thousands of people achieve noticeable results. We apply a medical-grade numbing cream to the treated area to make sure the procedure is virtually pain-free. People commonly assume the Vampire Facial is painful, but when performed correctly you should feel little-to-no discomfort during the entire treatment. Our team draws a small amount of blood that is then placed into a centrifuge. The device then separates out the PRP, which is comprised of platelets, growth factors and cytokines, from the red blood cells in order to create the natural solution needed for treatment. Once again, the blood sample drawn is relatively small and is processed thoroughly to ensure the critical components of PRP are extracted. We commonly refer to PRP as “liquid gold” given its yellow color and incredible effectiveness! We apply the PRP topically by using a microneedling device that creates tiny micro channels through which the solution can enter the skin. This helps the PRP better penetrate the skin to produce its intended results. We then apply additional topical PRP to the skin to more deeply saturate the treated area. So, how quickly can you expect to see visible results from the Vampire Facial? Well, almost immediately! Patients typically notice improved texture and complexion following treatment. These results continue to improve over several weeks, with most people experiencing a reduction in pore size, decrease in acne and onset of collagen stimulation. We recommend patients undergo at least three Vampire Facials to achieve the treatment’s maximum benefits and really lock in results. Unlike other procedures that cannot be done year-round due to risk of sun exposure in the spring and summer months, the Vampire Facial carries little to no downtime after treatment and is great for any time of year. Myths and misconceptions will always exist within our industry, especially for procedures that are less well known to the public at large. My team and I aim to provide patients with the best care possible by using research-backed, proven science that delivers on its promised results. The Vampire Facial can transform your skin health, so discover its power for yourself and come see us today! To learn more about the Vampire Facial and determine if it is the right treatment for you, schedule your own personal consultation or call us at 205-870-0204.